The Volvo XC90 2.9 Executive Geartronic is one of the high performance versions of the XC90 range. Manufactured at Volvo's Torslanda Plant in Sweden, the XC90 has gained a reputation as a slightly dull, but massively versatile vehicle. Top Gear host Jeremy Clarkson has owned three XC90s in the past. And if you can please him, then it must be good. Highlights of the Volvo XC90 include high safety scores, especially for front end impacts and pedestrian safety. The roof is also reinforced with high-strength steel to protect the occupants in the event of a roll-over. 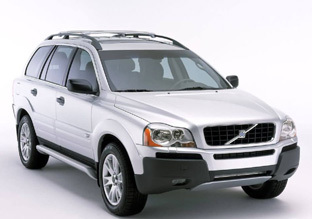 The Insurance Institute for Highway Safety has previously given the Volvo XC90 their Top Safety Pick award.